The one with braces or a weird smile? Modern day orthodontic solutions are not as bad as they were in the 70s and 80s. The technology has improved and there are many better options to choose from. Depending on the degree of misalignment, age of the patient and future development of the tooth, our dentist would recommend the most suitable braces treatment in South Delhi. Extreme cases of misalignment may need metal braces to correct the alignment. However, once the alignment is correct, braces can be removed for good. Metallic braces are strong and affordable. It is usually recommended for extreme cases of misalignment and in cases of child orthodontics. Ceramic Braces work as good as metallic braces while being aesthetically superior. The braces are coloured to match the shade of the teeth. 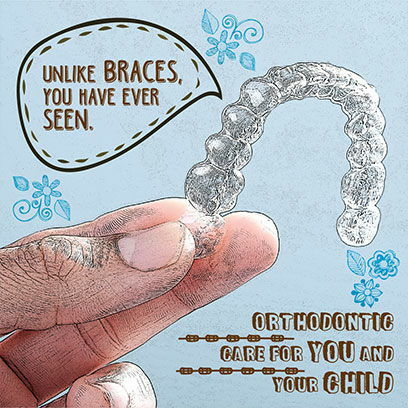 Invisalign treatment is recommended for minor misalignment only. The braces are transparent, removable making it easily conceivable. Our dentists specialise in the use of Invisalign procedure. Lingual Braces involve putting metallic braces at the back of the teeth. This technique is preferred for adult orthodontic patients who have higher degree of misalignment. It is important that you take your child routinely to the dentist from an early age. A child must be checked for need of orthodontic treatment at the age of 6 years. When the teeth and the jaw are still developing, it is easier to treat conditions like crowding of teeth. Summer break is a great time to start orthodontic treatment so that your child gets comfortable with the new dental device without having to miss classes. Green Park Dental is the leading dental clinic in Delhi that offers modern dental care with a personalised experience. Our in-house team of specialists and technicians create precise solutions for your smile needs. We have a team of experienced orthodontists in Delhi who specialise in treatments like Lingual Orthodontics and Invisalign. To know more about braces and orthodontic treatment in Delhi, contact our front desk today.